We did the testing based on android target to 8.1 and minimum to 4.3, it works fine, please refer below video. Could you please confirm if you clean you packages when building the sample? I think this issue maybe caused you didn't updated the latest package. 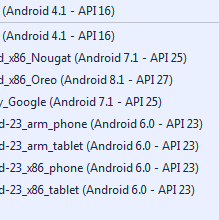 You can double check that in the bin folder before running the sample on Android Device. If there is still any issue, please feel free to let know that, we will help you to figure out that. I can't test on a virtual device as I'm already working inside virtualbox, my test are done on a samsung s8. What's the API level of your s8? You can view that in your VS after connect your device to PC. Thanks for your information, our developer will look into it. Any update I will let you know. Please update MapSuiteMobileForAndroid-BareBone package to 11.0.0-beta044 and it will solved.